See scan - absolutely perfect condition. This is a nice and rare German / germany Freemasonry / Masonic commemorative sterling silver medal. 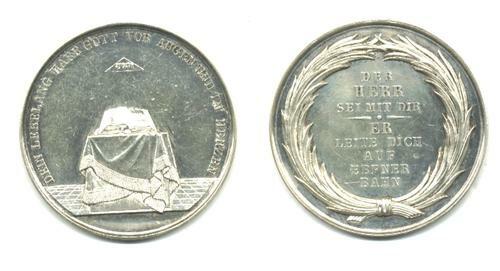 One side shows the temple and oltar with text surrounding it reading DEIN LEBELANG HABE GOTT VOR AUGEN UND IM HERZEN and the reverse has a wreath and text in the middle saying - DER HERRSEI MIT DIR * ER LEITE DICH AUF EBFNER BAHN. Nice masonic memorabilia collector piece and one of the nice Masonic medals.